University of Texas at El Paso President Diana Natalicio said that she was disappointed that a high-profile boxing match on her campus has been canceled and that she hasn't been told why it wasn't being held. University of Texas at El Paso President Diana Natalicio told The Texas Tribune on Wednesday that she has not been told why a high-profile boxing match on her campus had been canceled. Popular fighter Julio César Chávez Jr. of Mexico and Andy Lee of Ireland were scheduled to duke it out for the WBC world middleweight championship in Sun Bowl Stadium on June 16 — but, as of now, that much-anticipated event will not be happening. University of Texas System Chancellor Francisco Cigarroa decided this week to cancel the event, but specific details regarding his reasons have been hard to come by. A UT System news release stated, “A specific event risk assessment was performed, and the conclusion was that the risk was higher than normal.” Subsequently, the event was canceled. "I think we were quite confident that our normal risk management procedures would suffice," Natalicio said, adding that she had not been told what the specific risk was. “I really don’t have any details,” she said, “and I just feel very, very sad that it ended up where we did. There are a lot of people in El Paso that are quite disappointed and upset.” Natalicio said she has been in contact with Cigarroa, who was not available to talk to the Tribune. The El Paso community quickly responded to the cancellation with disbelief and anger. Local lawmakers wrote to the chancellor calling the decision “ill-informed, baseless and destructive.” At a Wednesday news conference in which law enforcement officials insisted that no known threat existed, El Paso Mayor John Cook revealed that he has placed an agenda item on next week’s City Council meeting condemning the chancellor’s decision. Cook was asked if the decision could be related to rumors that Chávez is romantically involved with a woman who has ties to recently indicted drug lord Joaquin "El Chapo" Guzman. “We have not been told this, but we believe that was probably the genesis of the decision that was made,” he said of the rumors, which he said have been familiar to law enforcement officials for some time. But even the Guzman link was speculation, he said, adding: “We still are standing by our position that there’s not a known credible threat.” Héctor Murguía, the mayor of neighboring Ciudad Juárez, Mexico, issued a statement positing that the match may have been nixed because of low anticipated ticket sales. Natalicio said that Cigarroa’s decision was “quite surprising,” because the university has hosted a number of events throughout the years, including monster truck rallies, major concerts and other boxing matches. Something like this has never come up. There have been no major security incidents at previous events, she said, noting that such events generate revenue for the school and the area as well as boosting community engagement. “We recognize that we have venues and facilities that are unique and should be used for more than our football games and our internal kinds of events,” Natalicio said. 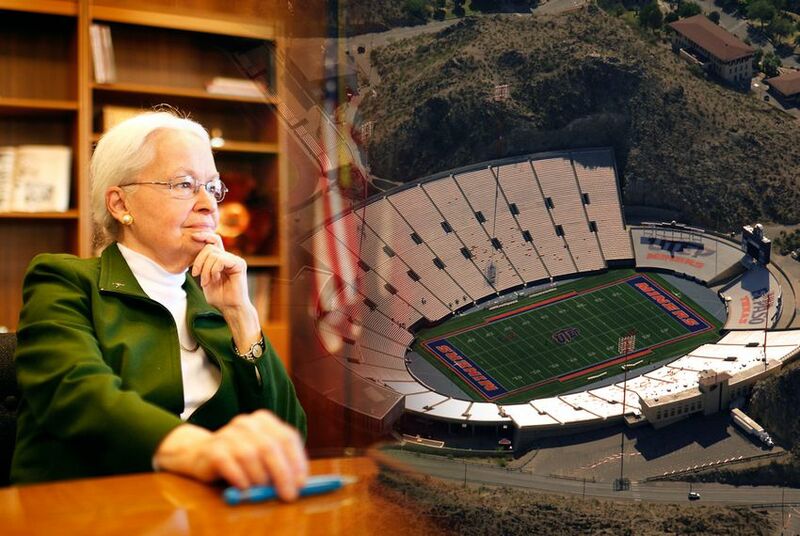 Cook, the El Paso mayor, also expressed concerns that the controversy surrounding the decision could negatively affect the results of an upcoming bond election aimed at generating funds to rehabilitate the Sun Bowl. Natalicio also indicated that the decision could have broader implications for UTEP by reinforcing what she called “misconceptions about safety and security in El Paso,” which crime statistics reveal is among the safest cities of its size in the country.